Split testing becomes fun when you can create variation pages quickly and that's one of the major advantages that Thrive Architect WordPress Page Builder offers: speed of implementation. 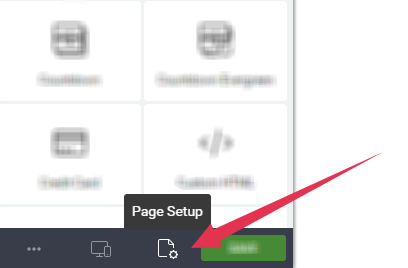 Thanks to the templates and the fast editor, you can get new pages set up very rapidly. Since first publishing this article, we released Thrive Optimize. Thrive Optimize is our own split testing solution. It integrates seamlessly with Thrive Architect and takes away all the hassle of setting up goals in Google Analytics or fiddling with code on your site. For a low one-time fee, you can set up as many A/B tests as you want. Watch the video below to see how quick it is to set up a split test in Thrive Optimize. The control is your original landing page. The challenger is the new landing page or a variation that we're going to test against the control. The success page is the one that a visitor sees after a successful conversion. If you are testing a lead generation page and using a confirmed opt-in (or "double opt-in") process, I recommend you make the confirmation page the success page. In other words, we're going to track visits to the confirmation page as a successful conversion, even though some of those visitors might not confirm and so won't end up on your mailing list. You can then track conversions from the confirmation page to the download page separately. The reason I recommend this setup is because it measures what matters: the opt-in page's primary job is to get people to sign up. Getting them to also confirm is the confirmation page's primary, so that should be measured and tested separately. This is a good way to quickly replicate the basic setup of the page and then create a variation of it. ​This is where you set the destination of your success page. Only enter the part of the URL that comes after the domain. This means each new subscriber will have different variables at the end of the success page URL. In this case, you can set the drop-down to "Begins with" instead of "Equals". Give your new experiment a name. 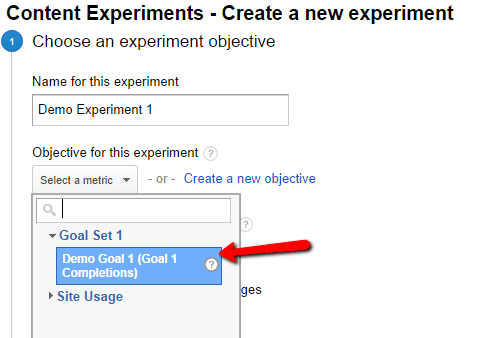 From the "Select a metric" drop down, pick the new goal we've set up in the step before. In the first field, set the URL of your control page. In the second field, set the URL of your challenger page. You can add further challengers if you want to test more than two versions of the page, but for this tutorial, we'll stick to just the two. In the next step, you are provided with a code snippet. Copy this code snippet and open your control page in Thrive Architect. 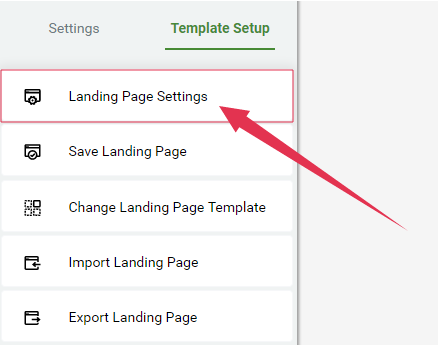 Then, go to "page setup", "Landing page Settings"
You should see both the checks validate correctly and you can then click on the "Start Experiment" button. 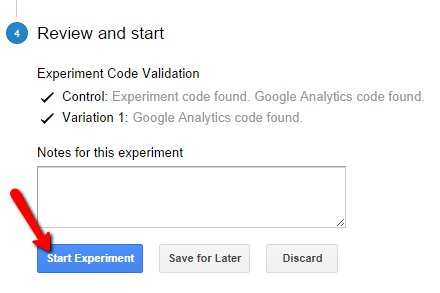 It might happen that the verification fails because no Google Analytics code is found on the pages. 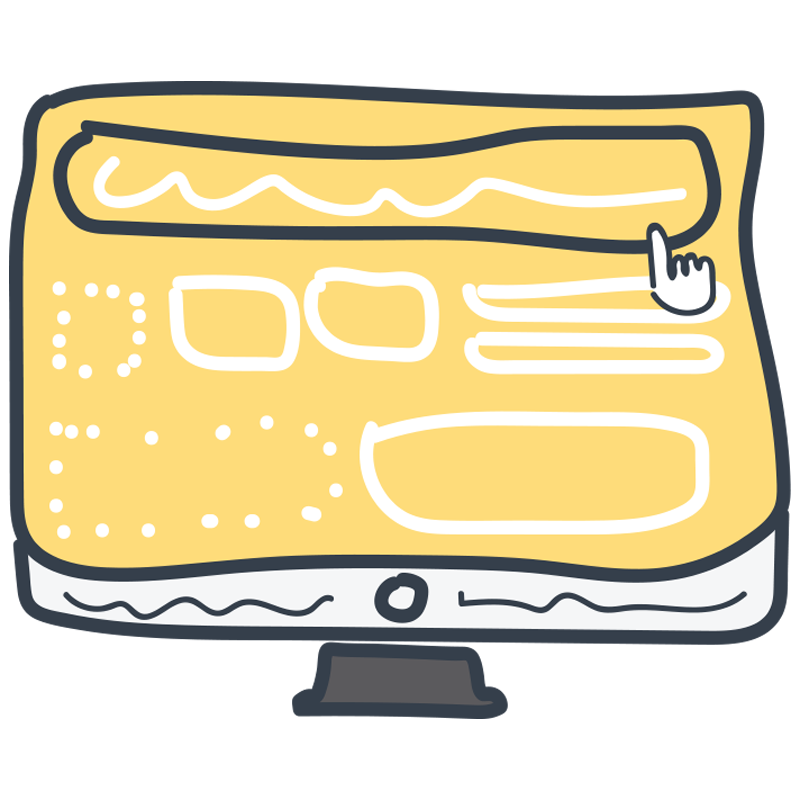 Depending on how you are integrating GA on your site, the code may or may not show up on landing pages. 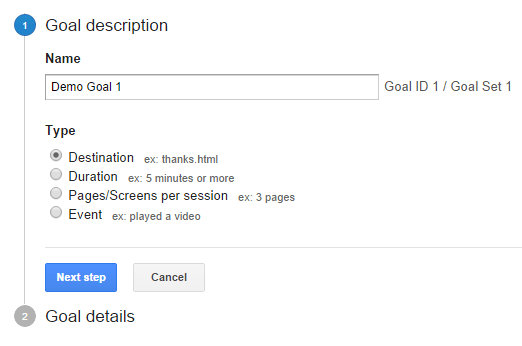 First off, my personal recommendation is that you use th﻿is﻿ Google Analytics plugin. 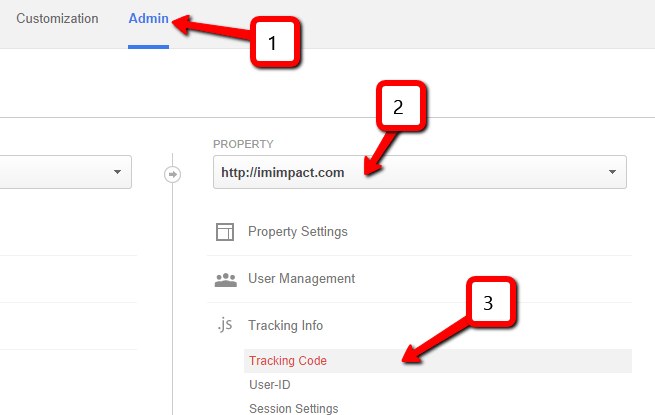 It's the easiest way to automatically add the Google Analytics tracking code to all your posts, pages and landing pages. Copy the tracking code and follow the same steps as above to paste the code into the first custom script field on every page involved in the experiment. 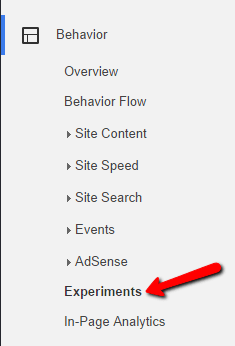 And that's your A/B test set up and running (as soon as you click the "start experiment") button. 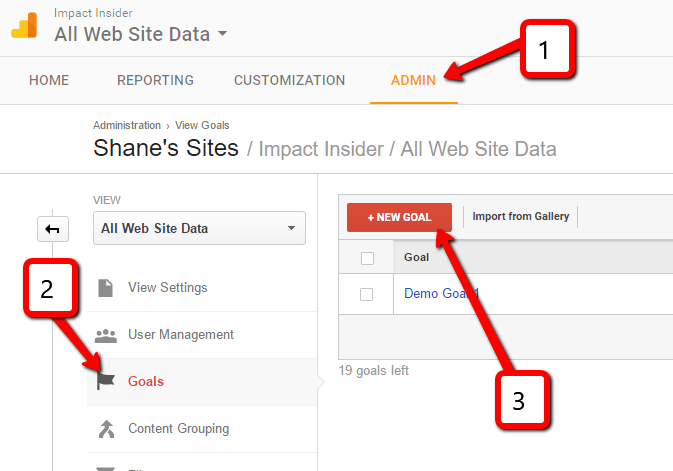 You'll now find a progress report in your GA dashboard and you'll be able to see which page does better. How to read this data and when to end tests will be a whole topic on its own. For now, let me just say that you should run the test for at least two weeks before making any decisions. Hi Shane! Glad to hear this works with Thrive! 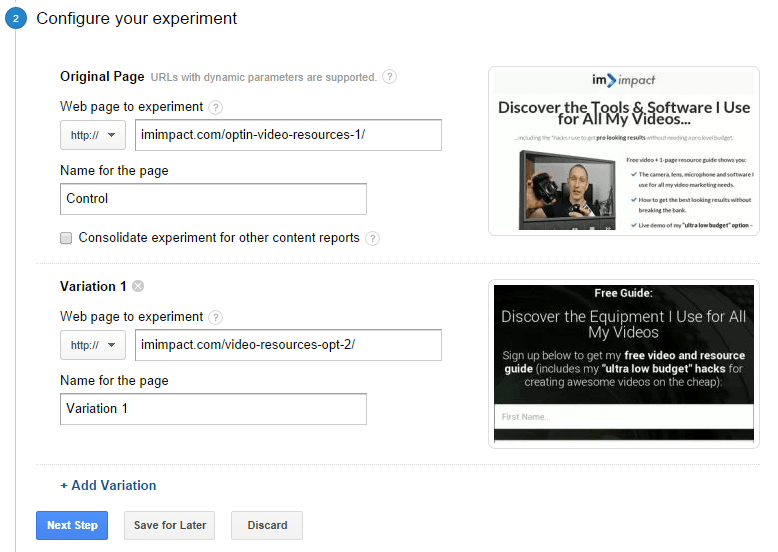 I’m using a plugin – Google Content Experiments – but haven’t had a chance to test it with TCB. Theoretically, it “should” work. Thoughts? It depends on how the plugin adds the code. In most cases it should work, yes. But there’s no way of knowing with all the different plugins that are around. Thanks, Shane. I’ll post back here when I test it and let you know how it turns out. Anyone lurking – watch the datestamp of these comments to make sure this is relatively recent information. Excellent tutorial – concise and clear. I’ve never used A/B testing before and intend to do so soon, so this will be my go-to tutorial when I get to that point. Thanks for putting it together, Shane! Thanks for your comment, Tip! 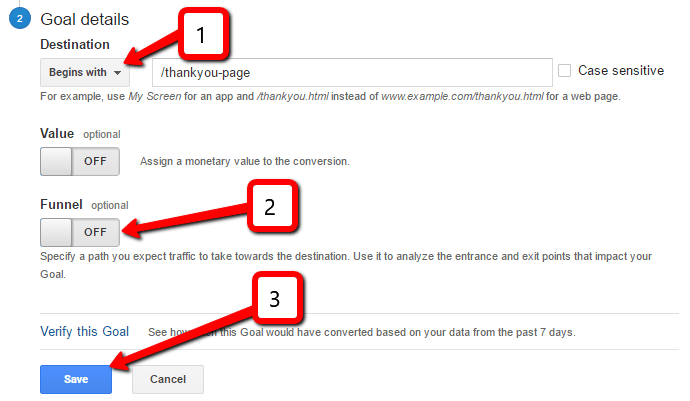 Thanks for the simple to follow Split testing tutorial using Google Analytics! Does this mean you guys are going to be releasing a Split Testing plugin we can use to make this even easier??? It a while it hasn’t been updated for a while, but it works perfectly. Thanks for the tip, Mario! Steve makes a valid point as well, though so I’d say: use with caution. Well done yet again Shane everyone always talks about split testing but they don’t tell you how to do it. Just love what you have done here! Thank you for your comment, Jule! Always happy to help. one question please… if you embed any of your variation pages in a frame, do you get a 404 error? I honestly don’t know about using iframes for this. My guess would be that it won’t work, because the testing script needs to be loaded in the page head section, to enable a redirect for part of the traffic. In an iframe, I don’t think that will work the way it should. Hey Shane, fantastic teaching, as usual! could you make a Video about your recommendation to split-test Banners ? Can you clarify what you mean by “banner”? I ask because it’s a word used to describe many things, by many different people. @Shane I intend any graphic element displayed on a webpage, that directs (when clicked) visitors to another page. As for example a classic “image banner”, but also the sidebar on http://imimpact.com/blog/. Ok, I see. Unfortunately, there’s nothing I can recommend off the top of my head. You can easily test it using the same method as shown here, but that would just test the banner on a single page. For site-wide tests of something like a sidebar banner, it’s more difficult. AdRotate might be a plugin you can use to test this. Very nice tutorial. Quick, packed with info, and didn’t waste time with a lot of fluff. I like your approach here and the other tutorials you’ve done. Hey Shane I can tell you that 200 sets of eyeballs is a valid test, so obviously some larger sites can reach that in a matter of hours. I’m afraid I have to disagree with you on this one. If you’re looking at just 200 impressions or visitors, that means we’re most likely talking about a single-digit or two-digit number of conversions. Say, for a sales process, 200 visitors might lead to 5-10 purchases. Split between two test variations, that doesn’t leave much. There is simply no way in the world you can measure anything relevant from 10 conversions or less. Even if we’re testing a high-converting page like a lead gen page, we’re most likely looking at <100 conversions from 200 visitors and that's still not a great basis to make decisions from. The other issue is the duration: every online business goes through cycles. In general, there are two major cycles. The day/night cycles for the regions that the majority of business comes from and the weekly cycle. In addition, there might be cycles created by periodic promotions, daily/weekly/monthly newsletters etc. For testing, it's important to be aware of the cycles in your business and how they affect your numbers and you have to choose the minimum running time for your test accordingly. A good rule of thumb is to run any test for at least 2 weeks for most businesses or at least one week for a business with extremely high volume. Finally, the validity of results depends on the conversion delta - i.e. the difference in conversion rate between the tested variations. Because of this you can never determine in advance how many impressions you will need to get a valid result. You can't possibly know this before you have an idea of the conversion delta. So, to get back to the statement about "a matter of hours": there are very few cases where this might be true. If you're looking at a business that sees several thousand conversions per hour and one of the test versions underperforms catastrophically (e.g. at 10% of the control), then maybe you can make a decision after just a few hours. But I bet that most conversion teams would decide to simply throttle the traffic to the "bad" variation and ride out at least a day or two, to see what's really going on. A question – I saw you use the success page url as a target page but should I use somewhere also the “confirm subscription” page? I mean, someone signs-up, they are sent to a “please confirm your subscription” page and only after they confirm heir email – they are sent to the “thank you” page (which you refer to as “success page). So, should I or should I not include the “please confirm your subscription” page somewhere to ensure the experiment works? Thanks in advance and keep being awesome! Ideally, it should be tracked as a funnel, so you know your conversion rate from the opt-in page to the confirmation page and from the confirmation page to the download page. In terms of what you should test for in an A/B test, the main issue is with how precise the tracking is. It’s in the nature of any kind of tracking or testing to not be 100% precise. In other words, just because your analytics tool tells you that 100 people have looked at a page doesn’t mean that there were exactly 100 people looking at that page. In reality, there may have been 90 people, there may have been 130 people… tracking is never perfect. In an opt-in process, you’re sending visitors away from your site (to their inbox) before they come back. As a result, there’s more room for tracking errors. That’s the only reason why I prefer to set the confirmation page as the success URL. Shane… do you have to publish the challenger page or does it stay as a draft? Wondering how to set up that cloned landing page. tx! Yes you have to publish the page. Hi Shane, great post. I’m look for a way to split test landing pages but also automatically select the winning variation. 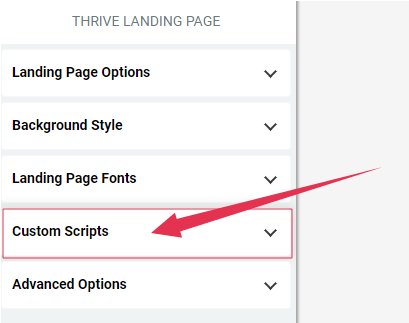 Can you use Thrive Leads to A/B split test landing pages that were created with thrive content builder? And if so, can you set it up to also automatically pick the wining landing page variation? The reason I ask it that if I get Thrive Leads I will not be using it for the popups, slide ins etc… I’ll only be using it for its ability to automatically select the winning landing page (if it can). There is no next video, I’m afraid. Are there any questions you still have about implementing this? I enjoyed your course. It was clear and concise. I learned a lot. Now I understand how to A/B test. I sounded so much more difficult before. Thank you for your comment, Nick! I’m happy to see that you found this useful. Greate feature! Thank you very much. Why I didn’t get the email with it? Where should I subscribe to receive the blog posts updates? Hats off for the great tutorial! I was in the dark pertaining to landing pages in WordPress. I was even playing around with some landing page themes. I got a question: do I have to use both Thrive Leads and Thrive Content Builder together? Or can one plugin would suffice for lead capture and email marketing. I lost a lot of time and wasted a few hundred dollars on tools, website builders, etc that Shane bundles in Thrive products. His blog posts could be “how to” for sale products. Gave up my $147 annual pricing to try click funnels and other solutions. After two months and frustration with various limitatìons, I am coming back to Thrive for long-term learning and refocus. It’s worth it to even though I must now pay more than $147 @ year. Fantastic tutorial! Thanks so much! Hi, this is a great tutorial, but when I’ve reached the final steps, my content builder doesn’t have a landing page settings where it should be, according to the video. I have only just started using your plugins, so have you changed where it is? I had the same issue – and here’s the solution. A) Simply add elements to an existing page on your site – that means it keeps the normal site header graphic and footer etc., (or however your theme does it). B) Add a Thrive Landing Page from the drop down menu (where the ‘Settings’ will then appear). So if the Settings option is NOT there, it means you are using method A. In which case, save any changes you’ve made as normal, then switch back to the standard WP page editor for that page, and (assuming you are using one of the base Thrive Themes) click on the Custom Code option in the Thrive Themes section at the foot of the page and insert the GA code into the Header Scripts area. Great tutorial, Shane. Thanks very much! After two years, could u consider o implement an A/B split test inside thrive builder as thrive leads have? It will be very useful for us! Would love to see AB testing added as a feature of Thrive Content Builder similar to what you have inside Thrive Leads. So you would use funnel option if you wanted to track something like sidebar newsletter signups, but not if you’re doing a specific landing page campaign right? Shane, great video and detailed instructions, you’re a good teacher. Until you guys come out with an A/B tester, these instructions will be very helpful. 1) What software are you using for the arrows in the blog post? 2) What’s your recommendation for video and audio? Is it worth to go all the way with a video camera/audio if I just want to create online courses (where my face would show up), or would a the Logitec C920 would do? 1) I’m using Jing to take and annotate screenshots. 2) My recommendation is to keep it on the cheap at first. I used very low budget video equipment for a long time, before I started really investing in this. You can learn more about my video tool recommendations here. The short answer is: yes, you can track across more than one website. This is called cross-domain tracking in Google Analytics (you can read about it here). Can this be done with the index/initial home page at a wordpress site? Like, when someone comes to the site — it A/B tests home page/landing page? Shane thanks for this information. I have been using it many times. I use the ignition theme and also have generated the homepage in this home page i cant find the page settings so i can enter the google code. Can you please advice? Hello everybody, do you have an idea, when this A/B Tool will be available? I am using the Splittesttool, but would prefer to work with Thrive, since I am using it for a long time and appreciate the system a lot. This works fine, but the urls look ugly. Can this be solved somehow? When will you implement the landing page split test in Thrive? Is the feature out yet? Hi Shane, thank you for this post. I would like to know if it’s possible to use a website page as a landing page. I would like to start an A/B test on one of the default page of my website, but content builder does not allow me to add the Experiment code. Great! Really helpful. Thanks Shane! I am using Squared Theme with TCB trying this method on my home page. However there is no option in TCB for custom scripts. I tried adding the script to the custom script section of the them on the wordpress page editor, but GA is still not seeing the script. I added there in the head script and GA is not recognizing it. Sorry I’m not sure what’s going wrong because that is exactly how we do it… make sure to update your page and to copy the complete code and to have the Google Analytics code installed on your overall website. When will the AB test feature available in thrive themes? I would love a/b tests on page, such as instances of CTA buttons, long form / short form landing pages, etc. This functionality built right into content builder would be amazing! I have had great success with Headline Optimizer! Almost a year later. Still not native a/b test capability. Hi Shane is there any update on native A/B page testing functionality within Thrive? We will work on this feature after the release of the Thrive Architect plugin. Unfortunately, every time I paste the experiment code into the page header on thrive page builder it totally destroys the pages html and I can’t reverse it any more…. When will the Page AB testing plugin appear? Hello Shane! I could never use the headline optimizer since I only use the visual editor to build landing pages. So I expected to find the AB-testing feature for headlines / text elements in the Architect, but :( So when will an AB-testing feature be included in the architect? Thanks again, your tutorials are terrific. Hey Shane, I paid for the thrive theme collection recently and I’m curious, Have the A/B testing been added because I can’t find it anywhere. Yes, it’s called Thrive Optimize and as a member you have access to the tool already!